Every moment of a user’s interaction with your product counts. Every single word in your product’s interface sets your product up to succeed or fail. The words in your user interface (UI) directly influence the decisions your users have to make. The role of a user experience (UX) writer, sometimes called a product writer, is to provide the user of a product or piece of software with a positive and easy experience. Dark patterns are user interface patterns specifically designed to trick a person into making a choice they wouldn’t want to make. When the words in your product frustrate, shame, or manipulate people into taking actions they wouldn’t otherwise have taken, the user experience fails. Even if your goal is to create friction with the intent to prevent fraud — say, if you’re in a highly regulated sector — the words in your design set the tone for whether a person will put up with the friction or abandon your product altogether. UX writers are responsible for making sure the language is clear, correct, and helpful. It’s better if the language is also inclusive and accessible, and it’s best if it doesn’t unfairly manipulate the reader. There are times when a writer might be tasked with creating language that just doesn’t feel right. While some writers might think they can’t push back on a client’s requests, that’s not necessarily the case. Here, we’ll take a look at some examples of manipulative language and give some guidance on how to handle it as a writer. 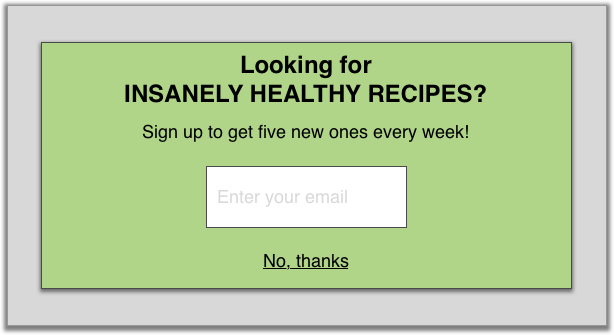 The scenario: You’re browsing healthy recipes on a website when a modal or overlay pops up asking if you’d like to sign up for their newsletter. 2) No, I hate being healthy! 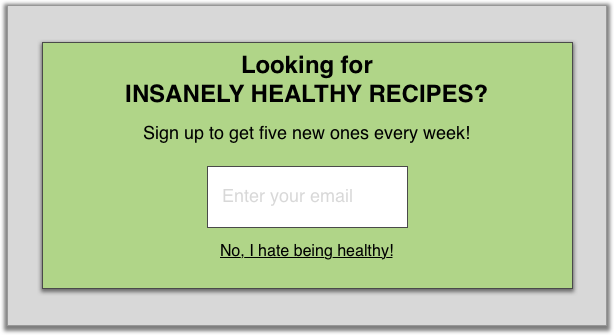 You don’t want the newsletter, but — well, you don’t hate being healthy, either. In fact, you’re on their website specifically looking for recipes to help you stay vibrant. If you click the opt-out link, you know you won’t somehow draw ill health toward yourself. But it still feels weird to “agree” that you “hate being healthy.” Signing up for the newsletter isn’t the option you want, and it feels like you’re playing into their hands. You feel manipulated and uncomfortable with either choice. If you’ve closed a web page in the past year, you’ve probably run into at least one instance of this kind of “confirm shaming.” Sometimes also called “manipulinks,” these manipulative bits of text attempt to guilt you into taking an action you don’t want to take. Now imagine another scenario. This time, you’re writing for an app. Your job is to make sure the words a person sees or hears when they use your product are clear, concise, and correct. You partner with a product designer and product manager (PM) from the conceptual stage of a project through the post-shipping stages, to craft words for the product. One day, you’re attending a kick-off session for a new project that’s launching in a month. Your PM says the goal of the project is to gain insight into whether people would be interested in paying more if you offered a particular new feature. 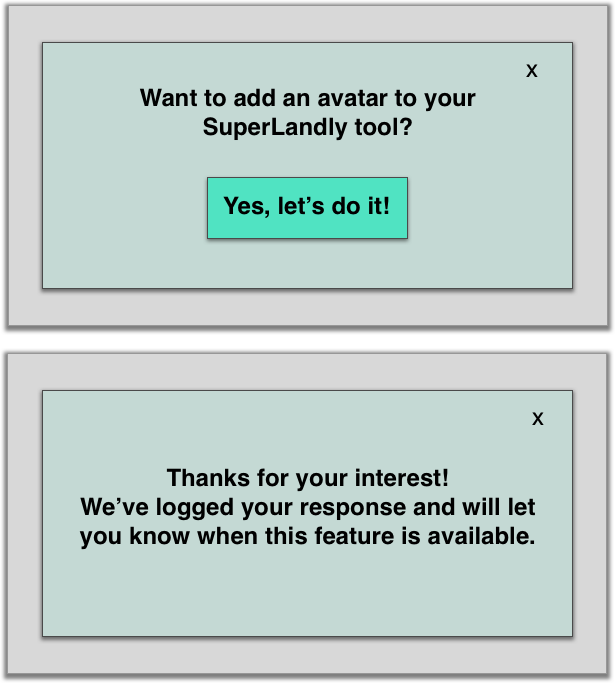 They want to have a modal pop up during the user’s flow, asking if they’d like to try the feature. There should be one Yes button and an X to close the modal. Sure, you say, sounds great… so… what happens when they click Yes? Does it take them directly to the new feature? As a user, that’s not a great experience. Sometimes called “false button tests” or “fake door tests,” these tactics to gain insight into users’ interests are also manipulative and can feel like bait-and-switch. But are they dark patterns? Or are they just badly worded (and poorly designed)? Now consider this scenario. You’re placing an order online for some food, when your roommate walks in carrying dinner for both of you. 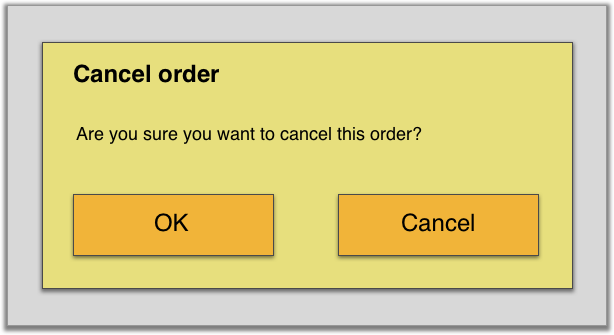 You navigate to the Cancel order button when this modal pops up confirming your cancelation. Are you sure you want to cancel this order? 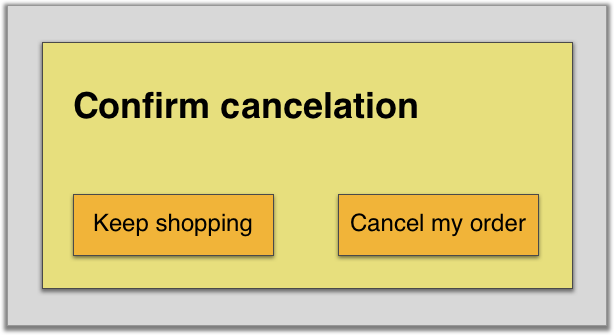 It asks, with the options OK and Cancel. It’s unclear what either option means. Does Cancel mean you’re confirming the cancelation, or does it mean you’re canceling the cancelation and therefore exiting the cancelation flow? Does OK mean you’re sure you want to cancel, or does it mean you’re OK with continuing the order? Are they dark patterns or just bad copy? As mentioned above, dark patterns are specifically designed to be manipulative, to trick a person into making a choice they wouldn’t otherwise have made. In the first instance, the manipulink is trying to guilt the person into making a decision they don’t want to make. But the user does have the option to choose the link with the guilt-mongering text. It’s annoying, it’s been proven to have poor results, but it’s ultimately just bad copy. In the second instance, the false button copy (Yes, I’d like to try this new feature) deliberately leads the person astray. They think they’re making a choice that will provide them with one outcome, but they are intentionally given a different outcome. This is a dark pattern… and it’s also bad copy. In the third instance, the exit modal presents the user with two confusing options. But it’s unlikely that the goal is to keep them in an infinite loop inside the app. This might be a dark pattern, depending on the intent behind the design… but it’s likely just bad copy. Sometimes, improving an entire user experience means changing some of the words in the design. This is why it’s important for writers to work closely with designers, researchers, and product managers. When someone who’s deeply immersed in the copy signals the need for a change, perhaps they’re seeing something beyond just the words. 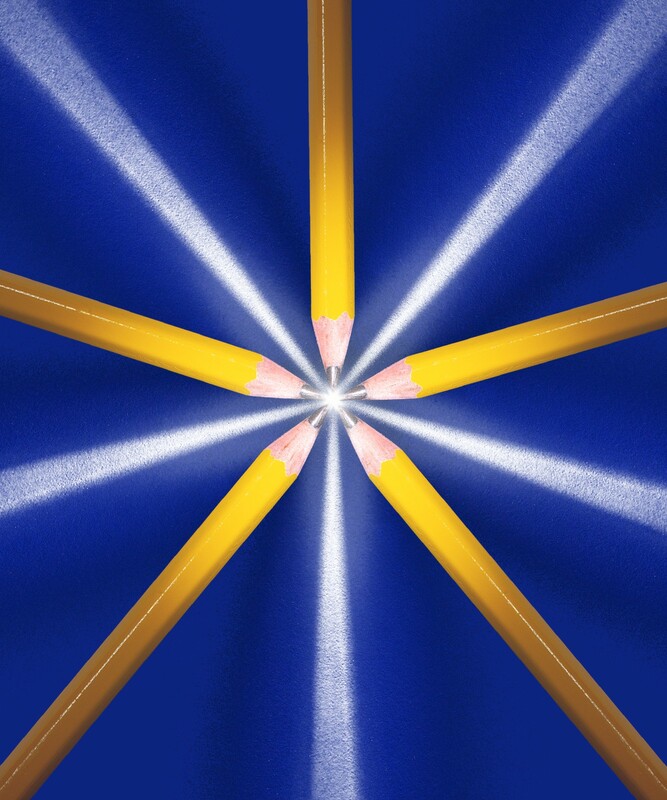 Keeping the product copy clear and useful can help prevent a project from becoming dark. Consider how different the experience might be if the modal with the fake door test made its intention clear from the start. It’s honest and straightforward to simply ask someone if they’d be interested in a feature, and there’s no manipulative copy involved. How can a product writer balance responsibility to the bottom line with thoughtful, ethical approaches to the words a user experiences? Since not every team has dedicated writers, it’s important to note that “product writer” here means the person who is writing the words that will ship in the product. Maybe it’s a dedicated UX writer, but maybe it’s a product designer, PM, engineer, or communications intern. The point isn’t that only someone with the title “UX Writer” can write their way out of dark patterns. The point is that anyone who is writing product copy should be able to write their way out of dark patterns. Not every writer feels they can take ownership over the final language decisions that get shipped. Having the confidence and ownership to push back takes experience and wisdom. It also takes some guts. But as product writers whose job is to make the user experience feel effortless through the words that exist in design, it’s also our job to make sure the words we use are accurate and not misleading. It’s our job to offer solutions to poorly worded experiences, but it’s also our job to maintain the integrity of our writing by refusing to write copy that deliberately misleads users. I don’t feel comfortable writing language that misleads users. I suggest we use ___ instead. This flow seems misleading. How might we get the information we’re looking for without implying the feature already exists? UX writing best practices typically have the button call-to-action match the verb in the header. 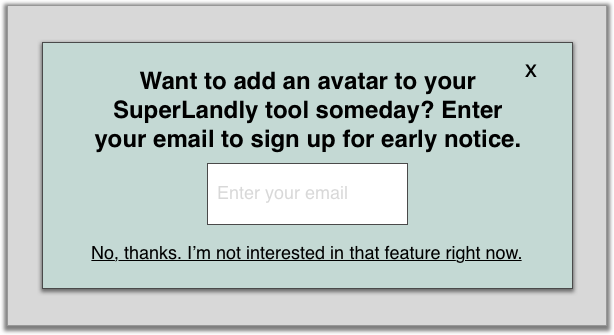 This modal would be more clear if the implied action in the title matched the CTA. How about we rephrase it like this: ___? Once you’ve put some of this language into practice, it becomes easier to hold steady to the goals of UX writing. As a writer, you can maintain the integrity of the user experience you’re creating, while knowing you don’t have to write stuff that feels wrong. The more that writers can help maintain clarity and ease of use, the better for everyone who’s using your product. And for many of us, that’s the ultimate goal. Huge thanks to Justin Tran for the illustration, and to John Saito and Michelle Morrison for their valuable input!